Whether they admit it or not, men love to style their hair as much as women do. To make their hair look gorgeous and perfectly set at all times, they look for the perfect hair gel or hair wax that will do the trick for them. While these do what they claim to do, that is, setting your hair, they are also filled with many chemicals which in the long run can harm the hair. A good way to eliminate the chemicals is using homemade hair gels that are natural and can be made easily. Check them out! Aloe vera gel is the best and probably also the easiest of homemade hair gels to use. All you have to do is work a little fresh aloe vera gel onto your palm and then use it to style your hair. 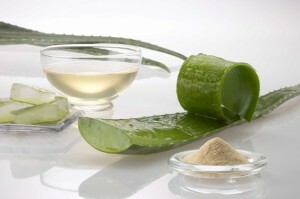 Aloe vera helps strengthen the roots of your hair and also make it soft and lustrous. Mix one tablespoon of honey along with one tablespoon of aloe vera. Add a little bit of coconut oil to this mixture. We are adding the coconut oil since honey is a bit too sticky in nature and adding the coconut oil will make it less sticky. Plus coconut oil also nourishes your hair. Apply this pack as required into your hair and style them the way you desire. Ground the peel of one orange into a fine powder. Add about one tablespoon of aloe vera gel to the orange peel powder. If need be, add some more aloe. You are looking for a thick paste-like consistency. When it is substantially thick, rub a little bit on your hands and work it into your hair. This is a 100 percent safe method, and as a bonus it also works well in getting rid of dandruff. Boil ¼ cup flax seeds in 1 cup of water over high flame. Once the water comes to a boil, lower the heat and let it simmer. After 10 minutes you will notice that the seeds begin to give out a gel of sorts. Continue cooking the seeds and stirring occasionally until all the water has achieved a gel-like consistency. Strain it after it cools down. Store in a glass container and keep it refrigerated. Use as and when desired. Give these homemade hair gels a try for sure. Making them might take a little more effort than buying one from the shop; but they are totally chemical-free, thus making them absolutely worth the effort!